Why Aren't Americans Getting the Mental Health Support They Need? Our nation is facing a mental health crisis. Millions of Americans are affected by a mental health condition, and every year we are seeing more individuals suffer from depression, anxiety, stress, and other mental health issues. It’s likely most of us have struggled with our mental health at some point in our lives, or have known someone who has been affected. This struggle greatly affects both personal and professional relationships, and without help, the condition will likely only get worse. As we enter Brain Awareness Week, Total Brain announces new research that shows 76% of 18-34 year olds admit they are struggling with their mental health, but only 1 in 4 currently receives professional help. In particular, 1 in 3 18-54 year olds say anxiety or depression causes them to be mentally unproductive at work and more than half of 18-34 year olds have severe or moderate mental fatigue. So why aren’t Americans getting the support they need? Unlike physical health concerns which are often clearly visible, mental health conditions may not be as easy to notice. In the work environment, employees often accept stress and anxiety as part of the job and may not realize they need to seek out help. Additionally, organizations are not doing enough to educate their employees and provide the mental health support needed to reduce stress and anxiety levels, which in turn means employees are unfocused and less productive in the office. Employees shouldn’t be deprived of the resources they need to improve their mental health. In fact, individuals who seek to improve their mental health are often happier, have increased memory and focus, and can even reduce the overall healthcare costs for the organization. Focusing on their mental health also means employees are less likely to experience physical health issues as well. With a platform like Total Brain, employers can offer an easy-to-use app to help enhance brain performance and productivity of their employees while also screening for the risk of mental conditions and pointing employees in the right direction to get the help they need. 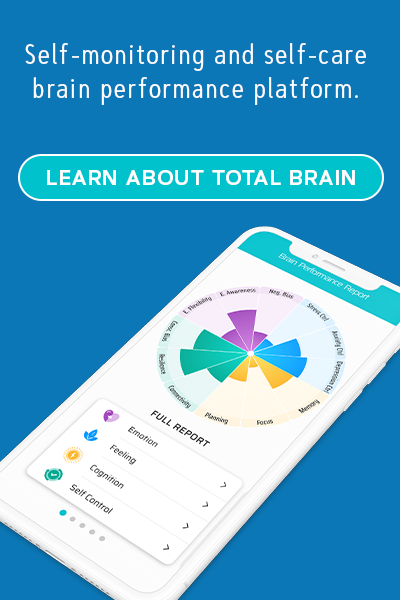 Used more than 16 million times by over 600,000 users, the platform reduces stress through personalized brain trainings, featuring exercises and content to help users consolidate their mental strengths and master their weaknesses. It’s every organization’s responsibility to take part in minimizing the effects of this mental health crisis we’re facing. With more organizations recognizing mental health as an area that needs to be brought to attention, more individuals will be provided with the resources and help they need to improve their mental health and wellbeing. Survey Methodology: Based on a 2019 study conducted by Total Brain and The PARAGRAPH Project among a representative general population sample of 1,008 people age 18+.